Join us on Sunday 10 March for the Australian Open FootGolf Series, followed by a family event where children can play FootGolf for FREE! Australia is part of the Federation for International FootGolf (FIFG) World Tour Series. 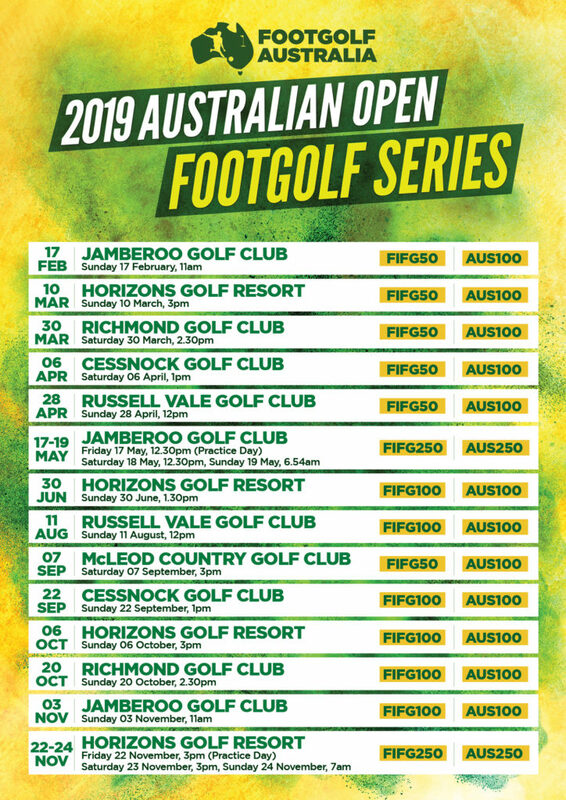 As part of this, there are 14 stages which are being held at FootGolf courses around Australia. Horizons Golf Resort is proud to be hosting 4 of these stages which will see the best players in the country compete. The first event for Horizons is this Sunday 10 March which is Stage 2 of the series. These events are open to all players – a great chance to take part and get a feel for the competitive side of the sport! This event will take place on Sunday 10 March from 3pm. The event is open to everyone! If you would like to be part of the competition, the comp fee will be $30. A great way to play alongside the pros, and get a feel for competitive FootGolf. Competition 3pm – Stage 2 Australian Open Series Competition. Prizes up for grabs! First place prize $100, and Runner Up prize $50! What is this Australian Open series? The Australian FIFG FootGolf World Tour Series (and other country events) will be played entirely under the rules of the Federation for International FootGolf (FIFG). Each tournament will follow the official rules of the sport, although local rules will apply. All local rules must be available for players before the initiation of the tournament. Each Stage (or competition) in the series has been given a category eg. FIFG50. These categories assist with allocating players points which go towards their World Ranking. For example if you place 1st in a FIFG250 event, you are awarded 250 points. See table later on! As mentioned before, only players who are registered as FootGolf Australia and World Ranking members are eligible to receive points. All other players will play as guests. So if you are keen to get into FootGolf – register as a FootGolf Australia member today; but remember you can also simply join the comp to be part of the action! Interested in participating in Stage 2 of the Australian Open Series at Horizons? Please get in touch with us if you’d like to participate in any of the events at Horizons. We encourage groups to join the event, learn a bit more about the sport. We invite local sports teams, soccer teams to enter players!